StitcheryJen: Cushions, quilts and bags. Well, I'm not entirely sure where the second half of February went! It's a little hard to believe it's March already, and autumn is well and truly on its way. As I sit and write this, it is the most gorgeous day outside, sun is shining and a gentle little breeze. I could quite happily be at home today, pottering around in the garden - pulling weeds and prettying it up again. It never fails to amaze me how a visit from my Mum makes me stop procrastinating about weeding!! So, fingers crossed for a sunny dry weekend. Instead of gardening lately, these are some of the things I've been doing. I have just received the most delicious range of fabric in the shop - it's called Sumptuous Living and it's Robyn Pandolph's latest creation. I cut charm squares from it as I wanted to make up something quite quickly - so made up this little cushion and a lap quilt. I did a tiny little bit of hand-quilting on the cushion and had forgotten how much I enjoy it, which is not to say I'm very good at it - but practice makes perfect! I need alot of practice! 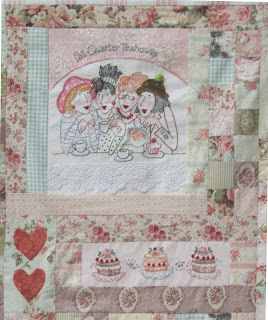 I am excited to be able to show you a couple of pics of Bronwyn Hayes new block of the month quilt that I am going to be running - called The Gingham Girls. Bronwyn has very kindly emailed these pictures to me and has allowed me to show them here - I can't wait to see the whole quilt. 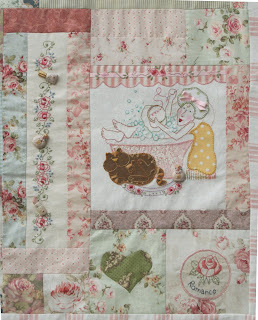 She has used some gorgeous novelty buttons on the quilt, and there is lots of beautiful stitchery and applique. Isn't it fabulous! I've got a couple of little classes coming up which I needed to make samples for - this is a little Easter Egg basket - and I'm also doing a pink version but it's still only partly completed. This is another fabric bucket class - I started out just making these plain and simple, but realised that the circles on the fabric were perfect for embellishing. The only trouble was, once you started, it was hard to know where to stop. and the bag back. Something I have always wanted myself, but never got round to making one. But now I have! Cushion club last week saw the girls making this little whimsy. Again it was amazing to see the different colour combinations that each person chose, and the end results - all were fabulous. This is what we will be making at next weeks Bag Club. I think this might be one of my favourites. So that's what has been keeping me busy lately - happy stitching! I sure wish I could join your stitchery BOM. That is just too adorable! The Gingham Girls looks cute. I'm slowly working on the Polka-Dot Girls. Bronwyn Hayes is one of my faves. Gingham girls certainly whets the appetite. I am still doing her "the wish quilt" still, but its looking good. So nice to be able to leave a comment. A Kittens Tail is looking yummy too. It is certainly interesting for me to read that blog. Thanks the author for it. I like such themes and anything that is connected to this matter. I definitely want to read a bit more on that blog soon.